Please turn it on, then reload/refresh this page. U.S. federal marshals seize Cuban boy Eli?n Gonzalez from the home of his relatives in Miami. Photo by Alan Diaz taken for the AP's Miami bureau. Alan Diaz was born and raised in New York. He moved to Cuba in 1964 to be with his parents, who had previously returned to their Cuban home. He earned a teaching degree in Cuba, taught school, and studied photography. He returned to the United States and began his photography career in Miami in 1978 while teaching English. In 1994 he began working with the Miami bureau of the Associated Press as a freelance photographer. He became a staff photographer in June 2000. 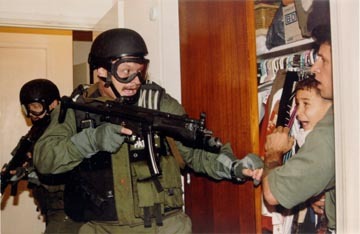 In August 2000 Diaz was selected by the Associated Press Managing Editors as winner of the 2000 Spot News Photography award for his pictures of federal agents seizing Elian Gonzalez. He was the only photographer to capture the moments inside the home in Miami's Little Havana section. "I was just doing my job," he said afterwards, "I did what I always do - I shoot pictures."